Mango Lassi is a popular drink in India where the climate is frequently sweltering. The yogurt-based drink makes a great treat on a hot day and is perfect for cooling down those spicy Indian curries. My understanding is that traditional lassi is actually a savory drink, made by blending plain yogurt with water, salt, and spices like cumin or mint. I’ve only ever had sweet lassi which is made by blending yogurt with sugar, fruit, and sometimes rosewater. 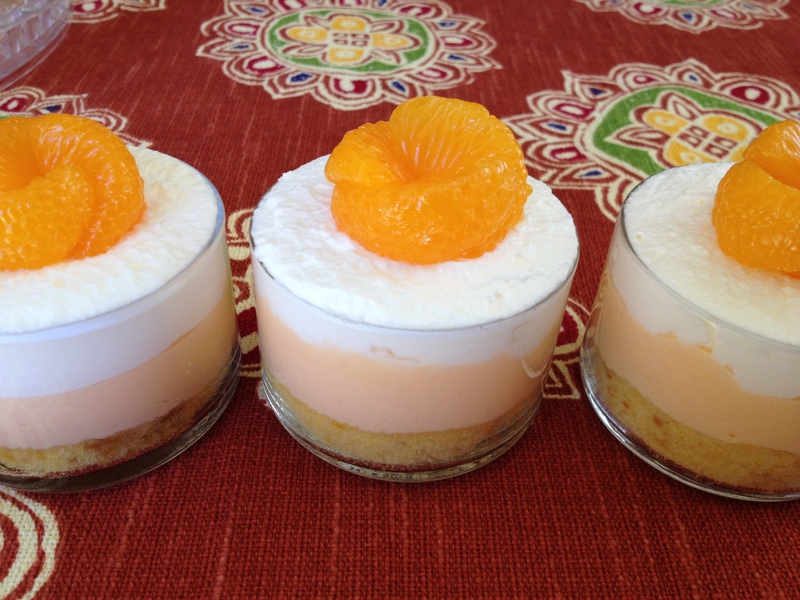 My favorite is mango lassi, though you could use other fruit if you like. Mango Lassi is so refreshing and addictive. It’s also very easy to make. The hardest part is getting your hands on some good mangoes like the ones from the Philippines. They’re thin-skinned and juicy and very sweet, unlike the fibrous ones that come from South America. Alphonso mangoes are a good choice and can be found more easily in the U.S., especially in Asian food stores. Put mango in blender and puree until smooth. Add ice cubes, yogurt, sugar, and pinch of cardamom, and blend all together well. If it seems too thick to drink, add a little water to thin it out to the consistency you want. Garnish with a mint leaf and 2 or 3 little cubes of mango, if desired. This recipe is one of those that’s been around forever under one name or another. It was given to me by one of the nurses at work. She’s been making it for years and she said it’s always a hit at her house. I’m glad I got the recipe from her because it was a hit with my family, too, though I did tweak it a little (as always). I increased the peaches, cut down on the sugar, and added vanilla extract. 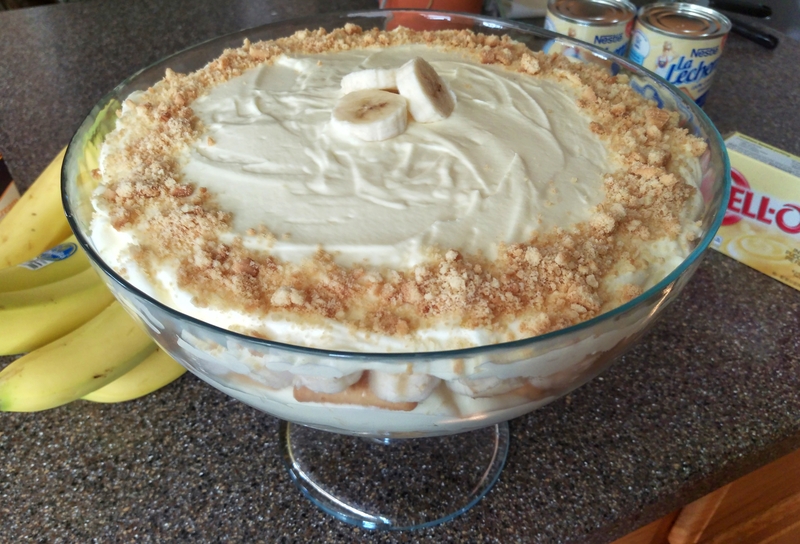 I can tell it’s going to become a favorite at our family get-togethers and at potlucks, too. This one is a definite keeper! Preheat oven to 350ºF. Grease a 9×13 pyrex glass baking dish. Drain both cans of peaches, reserving 6 tablespoons of syrup for later. In a bowl, mix flour, baking powder, salt, and vanilla puddings together. Add milk, butter, and eggs. Beat together with an electric mixer, about 3-4 minutes. 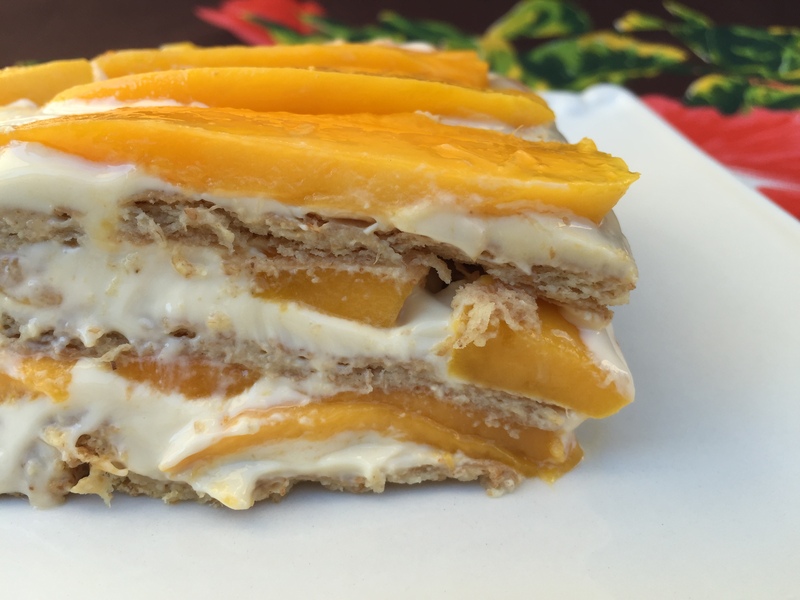 Arrange peach slices to cover top of batter. Beat cream cheese in a bowl until smooth. Add sugar, peach syrup, and vanilla, and beat until well-combined. Spoon over peaches, then smooth with a spatula. Sprinkle cinnamon-sugar over cream cheese mixture. NOTE: To make cinnamon sugar, the ratio is 1/4 cup sugar to 2 teaspoons cinnamon. Store in an airtight container. For this recipe, you’ll probably only sprinkle about a couple of tablespoons or so over the top. It’s Bashful’s birthday today. She’s turning 23. Where did the years go? It’s so true that time flies faster the older you get. Like her namesake, Bashful is shy and sweet and kind-hearted. Been that way since she was a little girl. She spoke just fine at home, but hardly said two words outside. Without fail, every new teacher she had would call me at the beginning of each school year to ask if things were alright at home because she never said a word in class. I would have to explain that that was just her way but if they called on her to answer, she would, even if she hadn’t raised her hand. She answered in this tiny little soft-spoken voice, but she answered. She’s all grown up now but when I look at her, I still see that quiet little girl who always stood to one side silently watching the world with big, solemn eyes and a shy smile. This morning I asked her what kind of cake she wanted for her birthday and of course, she asked for her favorite Strawberry Cream Cake. Its always been her favorite and that hasn’t changed over the years. I’m not surprised. This cake is so fabulously good. I make a moist vanilla cake for the base, use sliced fresh strawberries in the filling, and cover it up with a fluffy whipped cream frosting. It’s Yummy with a capital Y! Spray three 9-­inch round cake pans with nonstick baking spray. Line the bottoms with parchment or wax paper, then spray the paper. Using an electric mixer fitted with a paddle attachment, beat the butter and shortening together until creamy. Slowly pour in the sugar, continuing to beat until light and fluffy. Beat in the eggs, one at a time, stopping periodically to scrape down the bowl as needed. Then add the vanilla, beating until well-combined. Reduce speed to low and add the flour and buttermilk alternately, beginning and ending with the flour in 3 additions and the buttermilk in 2 additions. Divide batter evenly between prepared pans, smoothing tops with a spatula. Bake 25-30 minutes or until cake tester inserted in center comes out clean. Place cake pans on a wire rack and allow to cool for 10 minutes. Invert cakes, peel off parchment paper, then re-invert so cakes are top side up. Cool completely before frosting. Trim tops off to make cakes level if desired. Hull, wash, and slice strawberries. Toss in a bowl with sugar and set aside until ready to use. Place whipping cream, sugar and vanilla in mixing bowl. Add more sugar if you want it sweeter or less if you want it less sweet. If you want really white frosting, omit the vanilla or use clear vanilla extract. If you have cake strips, use them! They really help the cakes to rise up evenly with nice, level tops. Summer has kicked in with a vengeance! Boy is it Hot!….. with a capital H! We’ve been experiencing some triple digit days these past couple of weeks. Believe me, 108 degrees is no picnic! This kind of heat makes me think of long, tall drinks, big bowls of ice cream, and cool refreshing salads. 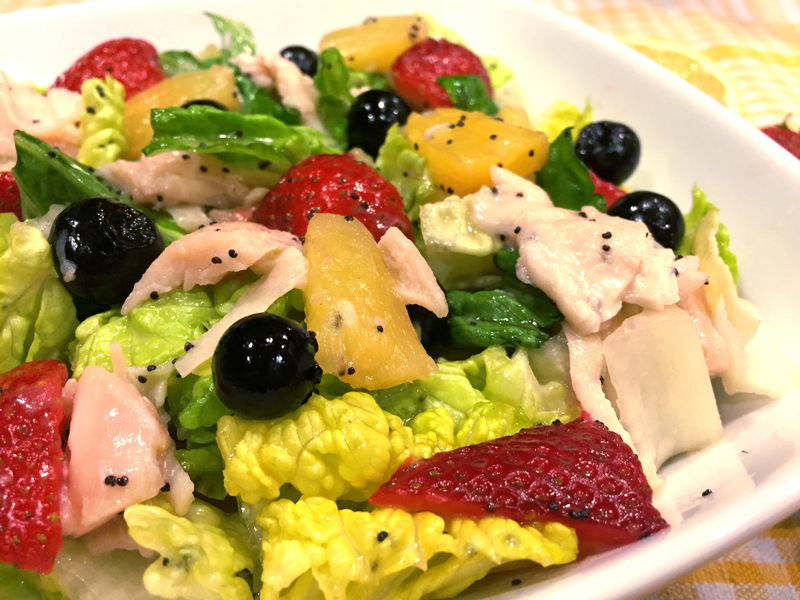 This salad is a play on my friend Cyndi’s winter fruit salad. I thought why not do the same thing for the summer except using fresh berries? I had some leftover shredded rotisserie chicken so I added it in for some healthy protein. The salad made a great lunch served with some of No. 1’s homemade french bread and a cool glass of crisp white wine. Mm… mm… mm….. Combine lemon juice, sugar, onion, mustard and salt in the container of a food processor or blender; process until smooth. With the machine running, add oil in a slow, steady stream and process until thick and smooth. Add the poppy seeds and pulse a few times to mix. 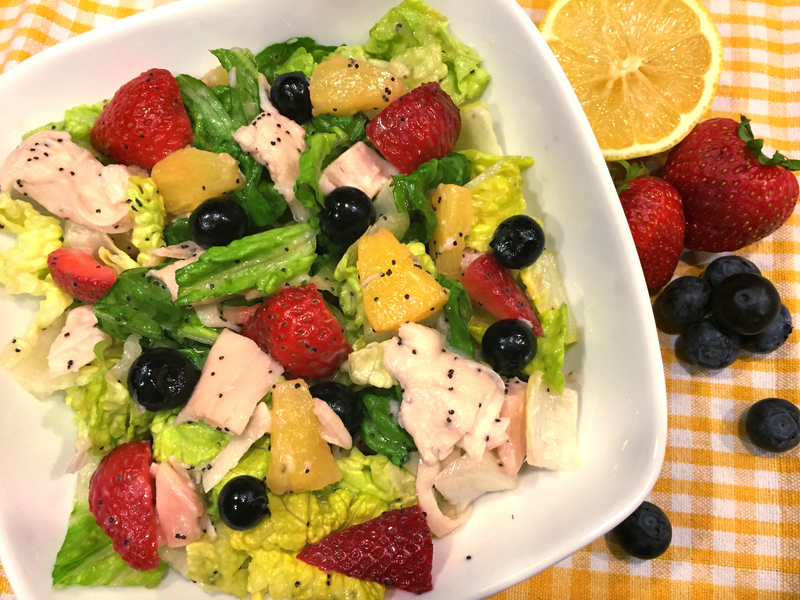 Place the lettuce, chicken, strawberries, blueberries, pineapple and nuts in a large salad bowl. Pour the poppy seed dressing over the salad. 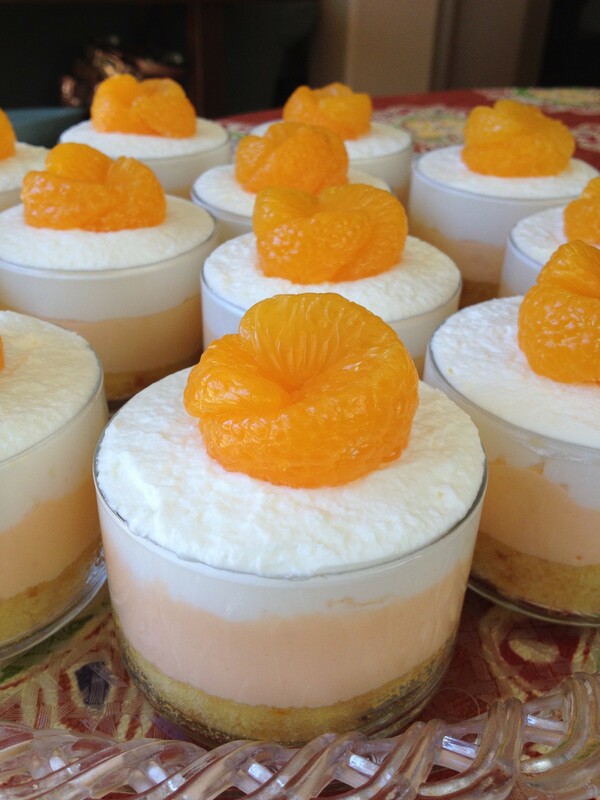 I love peach season…. the hot summer days when the peach trees are heavy with fruit just waiting to be harvested. And what could be better on a balmy summer’s evening than a dish of warm peach cobbler with a big scoop of vanilla ice cream melting on the side? The amazing smells that fill the kitchen as the cobbler bakes make you drool with anticipation. If you have the time and some of those fresh summer peaches I mentioned, by all means go ahead and use them. They’re so delicious, you won’t regret it. 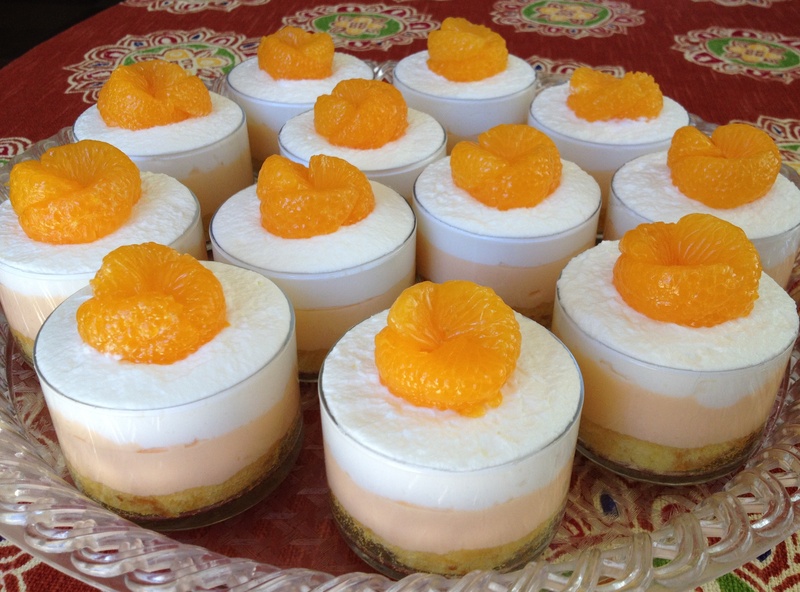 That being said, this recipe is “easy” because it uses canned peaches. No need to peel, slice, or cook them. Can’t beat the ease and convenience of that on a lazy summer day! Melt butter in a 9×13 baking dish in the oven. While butter is melting, drain syrup from medium size can (15-oz.) peaches and discard syrup or save for another use. Using a wire whisk, stir sugar, flour, baking powder, and salt together very well in a medium bowl. Slowly add milk, stirring continuously until well combined. Pour batter directly over melted butter in baking dish. Do not stir! Carefully spoon drained peaches from medium 15-oz. can on top of batter. Do not stir! Then gently add the peaches with the syrup from the large 28-oz. can. Again, do not stir! If desired, sprinkle cinnamon (as much as you like) over top. Bake for 35 to 45 minutes or until top is golden brown. This is great served warm with vanilla ice cream or fresh whipped cream. 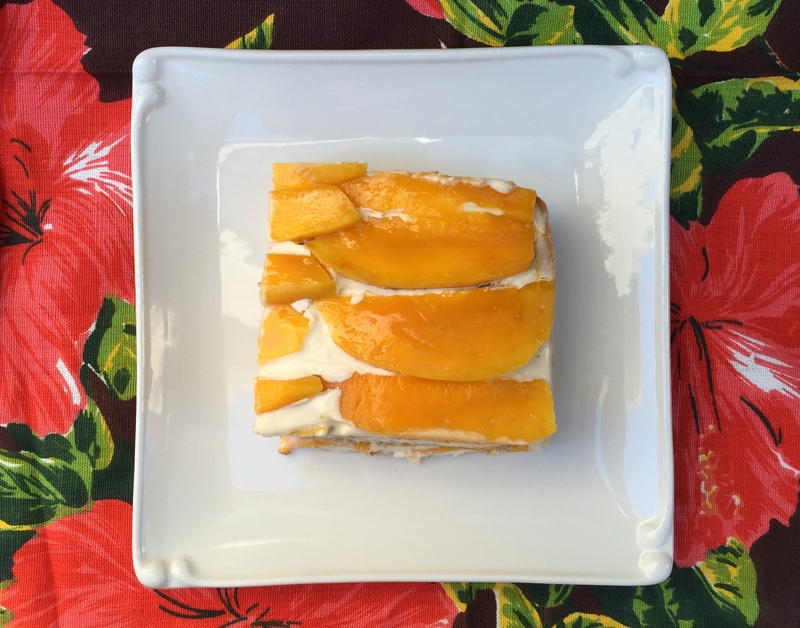 NOTE: If you prefer to use fresh peaches for this recipe, you’ll need 4 cups of peeled, pitted and sliced peaches (about 5-8 peaches depending on how big your peaches are). Place the peach slices in a saucepan with 1 cup water and 1 cup sugar. Bring to a boil, then lower the heat to medium and simmer for 10-15 minutes, stirring occasionally. You will use the peaches with the syrup for this recipe.